Neck Pain? Learn What The Swiss Discovered & How Life First Chiropractic Can Help! A recent study published in an international peer reviewed journal found that patients with neck pain as a result of cervical spine disc herniation respond favorably to chiropractic adjustments. 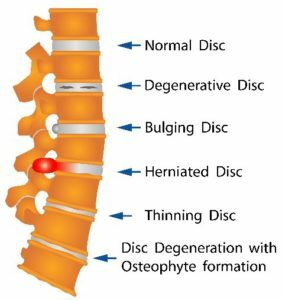 In every case of a prolapsed disc, the severity is different so it is important to address each patient according to the injury; however, the Swiss study does add to the already growing number of published books, articles and medical literature that finds the majority of cases respond well to chiropractic care. If you are suffering from back or neck pain, the first step is to come in and get a thorough assessment completed and let Dr. Ashley recommend a treatment plan for you. Bonus: come into the office and get pain and stress relief by enjoying our new massage bed! Life First Chiropractic promotes consistent chiropractic care which will restore function to the body, remove tension from the nervous system and tissues, and allow the healing power of the body to cure itself and function naturally. At Life First Chiropractic, we use varying methods and techniques to assess and correct areas of imbalance in the spine, with techniques that are suitable for pregnant moms, small kids and large adults. If you’re suffering from severe neck, back or arm pain, call Life First Chiropractic today on (954) 941-4000 to schedule an appointment for a thorough examination and assessment. We are dedicated to your overall wellness and reducing pain, so you can live a full and energized life. Peterson, C.K., Schmid, C., Leemann, S., Anklin, B. & Humphreys, B.K. Outcomes From Magnetic Resonance Imaging – Confirmed Symptomatic Cervical Disk Herniation Patients Treated With High-Velocity, Low-Amplitude Spinal Manipulative Therapy: A Prospective Cohort Study With 3-Month Follow-Up. J Manipulative Physiol Ther2013: (13) S0161:4756. Sometimes in life, people tend to minimize the importance or impact a situation may have only to later suffer the consequences for not taking action. Did You Know that a minor fender bender can cause injury to the body that can result in pain and diminished physical capacity? Immediately following the fender bender, you may feel no pain or discomfort at all. In fact, the impact to your body may not become evident until well after the 14 day requirement imposed by the insurance companies. This means that if you see medical care AFTER 14 days, you may not get coverage from your insurance provider. Taking immediate action after an accident, no matter how minor, is critical. Chiropractic care helps get you back on the road to recovery fast. Whether it’s a car accident or a slip and fall at home, accidents happen and when they do, chances are your body has been thrown out of alignment. The question is, to what degree? Many people have found relief in chiropractic care after having sustained injury from an accident. The forces absorbed by the body from an accident can push the vertebrae out of alignment and the symptoms of injury are not always immediately evident. It could take days, weeks and sometimes even months for symptoms to occur. This is why it is important to be examined after any accident. The human body has a natural capacity for self-healing; however, the natural healing process is helped or hindered by function of the nerves. Nerves pinched by spinal misalignment can cause varying degrees of discomfort and they compromise the body’s ability to heal itself. Chiropractic treatments readjust the spine so that it comes back into alignment, relieving pressure on the nerves thus allowing healing energy to flow. Seeking Chiropractic care after an injury also has the added benefit of exposing conditions that you may not be aware of. Occasionally a patient will come in seeking relief from an injury sustained in a crash or fall and the examination uncovers a health issue completely unrelated to the injury. If the issue can be addressed through chiropractic care, an appropriate treatment plan will be recommended. Your chiropractor will always advise you to consult with your primary physician if necessary. Ignoring injuries because they don’t seem serious or because they are not causing problems at the moment can have serious health implications in the future. Opting for chiropractic care is a way to help your body heal naturally, and in many cases faster, than simply treating symptoms with pain medication and time. Keep your body healthy and moving smoothly with Life First Chiropractic care. Remember injuries can often be subtle and seem invisible for a time. We can find spinal misalignment issues and get you on the road to a fast recovery. Ready to make your first appointment? It’s never been easier! 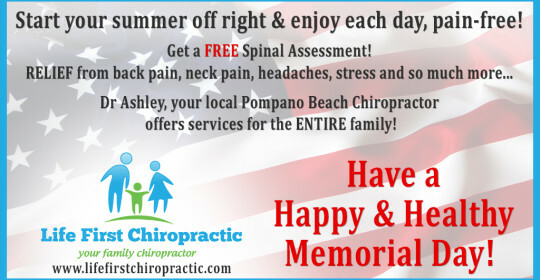 Book online at www.lifefirstchiropractic.com or call (954) 941-4000. Who’s Got Your Back? Local Pompano Beach Family Chiropractor Changing Lives! Are you experiencing back pain and can’t figure out the cause? Are you pregnant and experiencing back pain as a result of your body changes? Believe it or not, back pain can be caused by a number of factors. Looking for a local Pompano Beach chiropractor who can help assess your condition and provide preventative care methods to preserve good spinal health? We are easy to find on East Atlantic Boulevard and offer services for the entire family! Optimum spinal health is operating under the best conditions and following simple steps to keep your spine in good shape. This includes standing, lifting, sitting, carrying items, reaching and bending. While good spinal health is associated with alleviating back pain, it deals with so much more. A well aligned spine can assist in preventing diseases, aid in providing a deeper sleep and improve energy levels. How can a prenatal chiropractor help expectant mothers? Expectant mothers have a number of things taking place throughout their bodies during the various stages of pregnancy. One of the main reoccurring complaints is back pain. Our prenatal services help expectant mothers alleviate back pain. A prenatal chiropractor will assist in keeping expectant mothers healthy while avoiding headaches, colds and other common illnesses that may result from a misaligned spine. How can children benefit from seeing a chiropractor? Kids may experience back pain from carrying backpacks, equipment or instruments that are too heavy. A Pompano Beach chiropractor can keep them well aligned while alleviating that back pain with a kind, gentle and fun approach. At Dr. Ashley’s office, kids love the environment and love to come back time and time again for the entertainment and pain relief. Life First Chiropractic accommodates all ages and members of the family in a warm, welcoming environment. There’s a reason why Dr. Ashley is loved throughout Pompano Beach. Call or come in and see how we’re changing lives today! Call today and put your mind and body at ease with a visit to Dr. Ashley and see why her clients love her and the family friendly atmosphere at Life First Chiropractic. So, My Chiropractor Says I Need a Nerve Assessment? Should I Be Worried? When your chiropractor tells you that you need a nerve treatment or nerve assessment, your initial reaction may be to worry or assume something is wrong. The nerves around the spine are delicate and critical for your mobility and corporal sensitivity, so this reaction is understandable. However, more often than not, receiving a nerve assessment is a practical and cutting-edge element of the treatment plan your chiropractor will recommend. 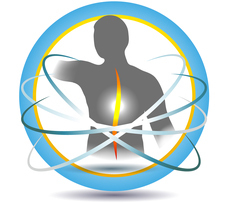 Your local chiropractor here in Pompano Beach uses a portable new technology called Tytron Thermography to assess the health of your spinal nerves and tailor treatment around any problem areas. As the blood vessels radiating from the spine constrict and dilate to regulate the body’s functions, the body’s temperature changes. Nerves that are pinched or misaligned result in tiny changes in this temperature that the Tytron Thermography wand can detect. In just 15 seconds, the Tytron can scan the entire back to assess the spine’s overall health. Receiving a nerve assessment is quick, painless, and incredibly helpful when tailoring your future treatment plan. Temperature variations may single small issues such as compressed vertebra, or larger nerve disorders. Because scans using Tytron Thermography are easy to perform and produce extremely accurate analysis, many chiropractors do an assessment before and after your adjustments and treatment. Each time you receive a nerve assessment using Tytron Thermography your results are automatically saved into your chiropractic file in Dr. Ashley’s office in Pompano Beach. This allows your chiropractor to track your progress as your back strengthens and heals. When you hear your local Pompano Beach chiropractor, Dr. Ashley say you need a nerve assessment, don’t hesitate or worry! This is some of the industry’s newest and best technology and can help make your treatment much more agile and responsive to your needs! 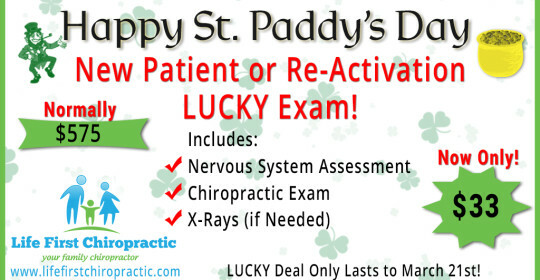 Call us today to make your appointment (954) 941-4000. Automobile accidents can cause quite a bit of pain and grief. Quickly getting on the road to recovery is one of the most important things you can do. Taking the time to work with a chiropractor who specializes in accident pain relief is one of the best ways to get your body back in top condition while working through the other logistics of your accident. Having a chiropractor who has experience treating patients that have had automobile accidents will help prove your case and assist in preventing you from becoming immobile or worse. Getting in touch with a Dr. Ashley, your local Pompano Beach chiropractor who is familiar with the process, time and effort involved can save time and money. If you have injuries, immediately seeing a chiropractor could save you from experiencing life-altering injuries that have had time to set in after an accident. Most people don’t realize that deep tissue damage may not show up immediately. A quick visit to the chiropractor will give them time to assess your condition and recommend a viable treatment plan that will work to your benefit. Don’t leave your injuries to chance after being in an accident. You never know when your injuries may flare up. Unfortunately, many injuries go undetected, which causes pain that could become uncontrollable. If you were rattled in any way, the first thing you should do after seeking medical attention is to visit Dr. Ashley, your local Pompano Beach chiropractor. Get a spinal analysis and x-rays done to check for internal injuries, and learn about solutions for dealing with minor pain, and a regimen for treating more extensive conditions that may have you impaired. Neck, back and limb injuries are common and may take days or weeks before demonstrating any indication that something is wrong. It’s all in the way you handle your situation. Put your well-being first and contact a chiropractor who can help pave a smooth road for your recovery and work with other medical and legal professionals who are handling your case. For more information on the benefits of working with a chiropractor, contact Dr. Ashley over at Life First Chiropractor today! Most of us know that you can visit your chiropractor for back pain relief, but did you know that your chiropractor can help in many other ways? From evaluating your posture to preventing those headaches that seem to arrive on a daily basis, there are many health benefits to regular spinal care. Learn more about the ways maintaining your spinal health can help you treat these common issues, and decrease dependence on other pain relievers, not to mention enhancing your comfort at work and play! The way you stand and sit while you work can have a direct impact on your neck and back. Walking, reading or working with your head thrust forward can cause chronic pain in your upper back--and you might be so used to leaning forward that you don’t even realize you are doing it. Your Pompano Beach Chiropractor, Dr. Ashley can help you determine just where your pain is coming from and provide a treatment plan that addresses both the pain and the cause of the pain. Taking aspirin or pain medication every day? Not sure what is causing your headaches? It may surprise you that it could be a result of your posture. The way you sit and walk impacts your spine--and according to the American Chiropractic Association, is a leading cause of headaches and head pain. Your chiropractor can help determine if your spine is to blame for your aching head--and come up with simple solutions to improve your spinal health and prevent disruption of your day from painful headaches. Backpacks seem to get bigger every year--and some kids end up toting half their body weight home in books and paper each day. If your child is experiencing back pain--and has just returned to school--that overfilled backpack could be to blame. Your local Pompano Beach Chiropractor, Dr. Ashley of Life First Chiropractic offers a kid friendly atmosphere where you can bring your child for treatment. She may not be able to eliminate the homework and backpack load but she can help with strategies that make carrying the load easier on your child’s back! If your child is complaining of backaches, a quick visit to Life First Chiropractic can help alleviate the pain without resorting to daily doses of pain reliever. Did You Know? Popping pills may actual be making your body sicker. Did you know, that there is a medicine (not mentioning any names) that if given to anyone over a period of time, requires you to get a kidney test to check to make sure you are not being poisoned?! How insane is that? Did you also know that many common illnesses can be treated and resolved by regular, chiropractic care? Illnesses like headaches, the common cold, asthma, cervical pain, allergies, sciatica, stress, insomnia, tendonitis and of course the treatments we associate with chiropractic care such as back, neck, knee injuries and pain. 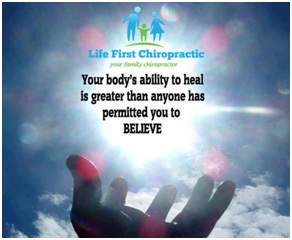 Your journey to true health cannot begin until you want to achieve your highest potential by seeking safe, natural and non-invasive care…and most importantly, your body won’t have to recover from taking any medication at Life First Chiropractic! Put your mind and body at ease with a visit to your local chiropractor, Dr. Ashley. See why clients love her and the family friendly atmosphere at Life First Chiropractic. Happy St. Patrick’s Day Special! From treating headaches and arthritis to reducing fevers and body inflammations, pain medication is routinely used for a variety of conditions. Since many of these medications are conveniently accessible over-the-counter, such as nonsteroidal anti-inflammatory drugs (NSAIDs) and acetaminophen, too many people that may be suffering from chronic pain opt for self-medicating in lieu of seeking proper treatment via chiropractic care. So, what are the risks of long-term pain medication use? Unfortunately, as your family chiropractor will advise you, simply popping a pill will never keep your body operating at its optimum potential. For instance, if you have a pinched nerve or an area of misalignment, then pain medication will only play the part of a “band aid on a bullet hole.” These conditions often require not only a proper diagnosis, but also a plan of action to reach your healthcare goals. Your journey to true health cannot begin until you want to achieve your highest potential by seeking safe, natural and non-invasive care. If you are suffering from any sort of pain, then Dr. Ashley will work to diagnose any problems and recommend a combination of diverse techniques to ensure that you or your loved ones experience the relief they desire. 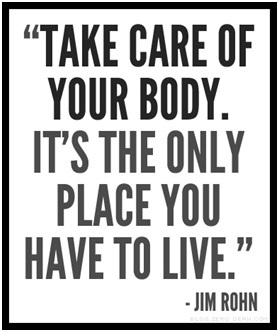 …and most importantly, your body won’t have to recover from taking any medication at Life First Chiropractic! Your health is your top priority when you’re expecting; it’s important you feel your best. As your baby grows in the womb, weight is put on your spine and other parts of your body, resulting in pain from this unusual pressure on your nerves, vertebrae, and pelvic area. There’s no reason for you to live in pain while you are experiencing one of the most exciting times in your life--awaiting the birth of your new baby. The safest way to get relief from this type of discomfort is regular visits to the chiropractor. Of course, medication for any reason should be avoided unless it’s absolutely necessary. Using a method like chiropractic care gives you the relief you need, without the worry and concerns about side effects drugs can cause. Another excellent reason to see a chiropractor during your pregnancy is avoiding pre-term labor. Many cases of pre-term labor are caused by the uterus being off center. Massage and adjustments by a chiropractor can help center the uterus and avoid complications like early contractions. Many women are joining the growing ranks who visit a chiropractor regularly. It’s a simple visit where you have some adjustments done, and within a few hours you feel “opened up”. This is because the baby moves up in your body, giving you relief from aching and pressure. Backaches are greatly eliminated or go away completely, and you can avoid bed rest or drugs to stop pre-term labor. Many healthcare professionals believe chiropractic care offers pregnant women relief from back, leg, and pelvic aches and pains. It’s a safe and drug-free alternative to alleviate discomfort. Put your mind and body at ease with a visit to your local chiropractor, Dr. Ashley. See why pregnant moms love her and the family friendly atmosphere at Life First Chiropractic. The holidays are in full swing and it’s easy to get caught up in the hustle and bustle of cookie exchanges, gift-wrapping, ugly sweaters, and holiday parties. By the New Year, you might be feeling sluggish and tense. Although some of that tension may be due to too many days with your in-laws, there are lots more ways the holidays can wreak havoc on your back and nervous system. 1. A Whole Lot of Holiday Stress: We know it can take a little extra effort to be merry and bright with mile long to-do lists and loaded holiday schedules, and a visit to the chiropractor could be the best gift you give yourself this season. 2. Two Tired Feet: Standing on your feet for prolonged periods of time (waiting in line, cooking, running errands), could throw your back out of alignment. 3. Three-Hour Layovers: And car rides, cramped airplane seats, train and bus rides. A visit to Dr. Whitford after holiday traveling should be a prerequisite after you’ve purchased that plane ticket. 4. Four Restless Nights: If you’re having trouble sleeping due to stress, you are more likely to toss and turn, pinch a nerve, or feel stiffness in your back the next day. We’re here to help. 5. Five Headaches Later: If you internalize stress in your jaw, neck, or back, you could experience headaches that can be alleviated by simple chiropractic realignment. 6. Six Gifts A-Gifting: Give a true feel-good gift this year and send your high-strung best friend to the chiropractor. Trust us, she’ll thank you later. 7. Seven Days A-Entertaining: Trimming the tree and decking the halls in preparation for company can knock your back out of alignment faster than Saint Nick can come down the chimney. 8. Eight Pounds A-Gaining: Combining a new exercise routine with chiropractic treatment tackles holiday weight gain and sluggishness with a holistic approach that will give you better, faster results. 9. Nine Days A-Shopping: If you strained your back lugging heavy boxes or balancing bags on your shoulders, a trip to the chiropractor can help alleviate those imbalances. 10. Ten Glasses of Eggnog: We won’t tell anyone you decided to have that extra glass of wine or eggnog, but we will be here to help you feel better afterward. A trip to the chiropractor can reduce stress and tension related to over-indulgence. 12. Eleven Cousins Screaming: Aside from the physical benefits of visiting the chiropractor, the time you spend in our office is quiet time for you. Escape for an hour and rejuvenate before tackling your next family dinner. 13. Twelve Hours of Detox: We’d love to be part of your post-holiday detox plan. No matter what the holidays brought you, you’ll leave our office feeling refreshed and re-energized. Unbelievable! Chiropractor adjusts 2 day old baby! What is spinal health? Optimum spinal health is operating under the best conditions and following simple steps to keep your spine in good shape. This includes standing, lifting, sitting, carrying items, reaching and bending. While good spinal health is associated with alleviating back pain, it deals with so much more. A well aligned spine can assist in preventing diseases, aid in providing a deeper sleep and improve energy levels. How can a prenatal chiropractor help expectant mothers? Expectant mothers have a number of things taking place throughout their bodies during the various stages of pregnancy. One of the main reoccurring complaints is back pain. Our prenatal services help expectant mothers alleviate back pain. A prenatal chiropractor will assist in keeping expectant mothers healthy while avoiding headaches, colds and other common illnesses that may result from a misaligned spine. How can children benefit from seeing a chiropractor? Kids may experience back pain from carrying backpacks, equipment or instruments that are too heavy. A Pompano Beach chiropractor can keep them well aligned while alleviating that back pain with a kind, gentle and fun approach. At Dr. Ashley’s office, kids love the environment and love to come back time and time again for the entertainment and pain relief. Interesting Chiropractic Facts – Do You Know Why Your Back Makes a “Cracking” Noise? Have you ever been to a chiropractor and heard a loud, distinctive popping sound when the chiropractor adjusts your spine? In many cases, the sound you are hearing isn’t from your bones at all--it’s from harmless gasses that build up in your joints; when your bones move, it releases the gases making that distinctive (and sometimes alarming) sound. Learning more about why your joints crack and why regular spinal alignment (and gas release) increases your health call Pompano Beach Chiropractor, Dr. Ashley. She can help you determine if you have anything to worry about. The most common cause of the cracking sound is actually the release of gas buildup in your joints. Your joints are filled with synovial fluid, which contains oxygen, nitrogen, and carbon dioxide gases. When your bones are moved, or sometimes when you stretch, pop, or crack a joint you cause those gases to rapidly release, forming little bubbles and the popping sound you hear. If you have arthritis and are experiencing pain, this may cause you alarm and could indicate joint damage or wear and tear. Sometimes the roughness of the cartilage and joint surface can occur after you have lost your smooth cartilage; depending on the severity of the deterioration your bones could actually be rubbing up against each other. If you are experiencing pain and noise when you flex your joints, a visit to Pompano Beach Chiropractor, Dr. Ashley can help you determine what is going on and what can be done to ease your pain. This can be a pretty common occurrence, which happens when your joints move and cause a tendon to move slightly out of place. In many cases, the sound you hear occurs as the tendon snaps back into its original position. It can also be caused by ligaments tightening as you move. Either of these situations may create a loud cracking when you move your knee or ankle. Though usually not painful, this sound can be accompanied by a pain in the joint or a feeling of tightness. Pregnancy can also cause stretching and popping and cracking as your body expands to accommodate your new arrival. As a chiropractor that regularly takes care of pregnant women, Pompano Beach Chiropractor, Dr. Ashley can help set your mind at ease--and ease your aching joints, too! Put your mind and body at ease with a visit to your local chiropractor, Dr. Ashley. 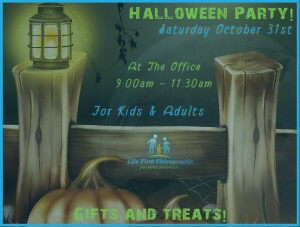 See why practice members love her and the family friendly atmosphere at Life First Chiropractic. Many parents in Florida have extolled the benefits of chiropractic care for children due to the treatment program’s efficacy in resolving and preventing chronic childhood diseases. Gentle, non-intrusive and drug-free, chiropractic adjustments address a wide range of health disorders. According to a recently concluded study by the International Chiropractic Pediatric Association or ICPA, spinal manipulative therapy, when provided by licensed practitioners, is a safe and effective way of treating children for health issues connected to the musculoskeletal and nervous systems. This affordable alternative treatment program ensures that the nervous system can work efficiently and communicate clearly to reestablish equilibrium in the body and coordinate better function and healing. Birth trauma and accidental injuries can cause acute conditions that can affect the health of a child. Misaligned vertebral joints caused by birth trauma or a hard fall/blow can affect the nerves and muscle tissue. A Pompano Beach chiropractor can correct the child’s spinal alignment to unlock joints, restore motion, and alleviate nerve pressure that may cause more illnesses. Many parents report that chiropractic care has successfully treated children’s health problems such as accident trauma, acute earache, muscle pain, neck pain, and upper respiratory infection. In addition, chiropractic treatment for children and infants is an alternative remedy for discomfort caused by colic and other problems in digestion. Spinal adjustment provided by a licensed Pompano Beach chiropractor can also improve a child’s overall well-being. The ICPA reports that children who undergo chiropractic treatment experience behavioral improvements, and have stronger immune systems and better sleep patterns. Despite the lack of conclusive scientific proof, the increasing number of people bringing their children to chiropractors is a testament to the benefits of chiropractic care for children. According to Chiropractic America, chiropractic care, which is drug-free and totally natural, can be more effective than traditional medicine for neck pain, scoliosis, and chronic earache. In addition, because spinal adjustments fix interrupted neural pathways, spinal alignment therapy can also address sleep disorders and headaches of unspecified causes. Allergy symptoms, asthma, and attention-deficit hyperactivity disorder (ADHD) patterns are also treatable by chiropractic care. The efficacy of spinal adjustment in addressing the health issues previously mentioned has implications for the capacity of chiropractic care to prevent ailments. A Pompano Beach chiropractor can perform periodic spinal adjustments on a child to ward off the ailments mentioned earlier before they even begin. Degenerative bone and joint diseases like osteoporosis and osteoarthritis can also be delayed or prevented by chiropractic adjustments. Most importantly, visiting a chiropractor on a regular basis can inculcate the importance of proactive health care in children. Children under the care of a chiropractor will most likely manage and monitor their health as they get older, and cope with health issues in a sensible, proactive manner. To sum up, one of the best benefits of chiropractic care is the cultivation of positive, lifelong health habits in children. Chiropractic treatment has several health benefits that you may not be aware of and by visiting your chiropractor on a regular basis; you can treat a wide range of conditions and symptoms. Millions of Americans visit their chiropractor for relief from back pain and several other conditions. Chiropractic procedures offer a holistic and all-natural way to treat neck or back pain and maintain a healthy musculoskeletal system. The chiropractic industry is continuing to grow and research continues to affirm its health benefits. Studies have shown that the practice reduces prescription costs and hospital admissions. Neck pain is one of the most common reasons to visit a chiropractor and those who experience frequent neck pain can benefit from chiropractic adjustment techniques. Chiropractors are effective at treating several different neck conditions – muscle strains and joint problems – but more serious problems are usually referred to the appropriate doctor on a case by case basis. People who experience stiffness and other neck problems as a result of car accident often benefit tremendously from chiropractic adjustment which can reduce inflammation and pain and reduce symptoms of whiplash. Those who also experience regular tension headaches can benefit from chiropractic treatments as well. Chiropractic treatment is also highly effective at alleviating back pain which is the single leading cause of disability worldwide. Chiropractors use adjustment techniques to carefully realign the spine into its natural position to ensure that the nervous system is not affected by a misaligned spine. Pressure point adjustments may create a popping sound, which is perfectly safe and similar to the sound that is made when the knuckles are popped. The popping noises are the sound of pressure changes in the joints. Those who visit a chiropractor on a regular basis for back adjustments commonly report improvement with pain and other symptoms. Many people who go to chiropractors for regular adjustments for neck, back or other pain can safely reduce their pain medication (with the approval of their physician). In many cases they can stop taking their medication entirely, as their pain symptoms are reduced to almost nothing with proper chiropractic care. People who receive regular chiropractic treatments experience less fatigue throughout the day. This can be attributed to improvements in the nervous and musculoskeletal systems that result from chiropractic procedures. The treatments optimize the body’s musculoskeletal system so that it functions as efficiently as possible, and this results in higher energy levels. Also, most people experience improvements in their nervous system and muscle control. Chiropractic procedures are very beneficial as it treats the whole person rather than the symptoms, and many chiropractors give advice on other aspects of health such as nutrition, fitness, ergonomics and more. Who do you know that needs hope in their life?